Twitter is definitely a platform we love to hate, for those of you who favour using it and would like to increase your online presence, reach and popularity, it is worth giving the following tips a go. With any social media profile, special attention should be given to what is immediately seen by others, such as your username, bios, profile picture and tweets, you can maximise its full potential. You can advertise or promote your business around the globe on Twitter and can increase your reach tremendously within a short span of time by smart efforts. Even researchers show that the most successful people around the world are more active on Twitter as compared to any other social media platforms. Your profile shows the world who you are, and the first impression always counts. Each element should include your best content and accurately reflect your message. One of the key segments of your Twitter profile is your name and the handle which has the name after the "@". Twitter handle is your personal id on Twitter. A relevant Twitter name can help you to be easily found on Twitter. Your real name may not be available, but try to get as close as possible. If users have already claimed your name, try adding an adjective or descriptor, such as “the”, “I'm”, “real” etc. Using made up name makes it very difficult to tie your Twitter profile to your Facebook, LinkedIn and other profiles. Your Twitter account demands two pictures which are header image which shows up on your profile page, and profile picture, which shows up on each one of your tweets and anywhere else. 1. 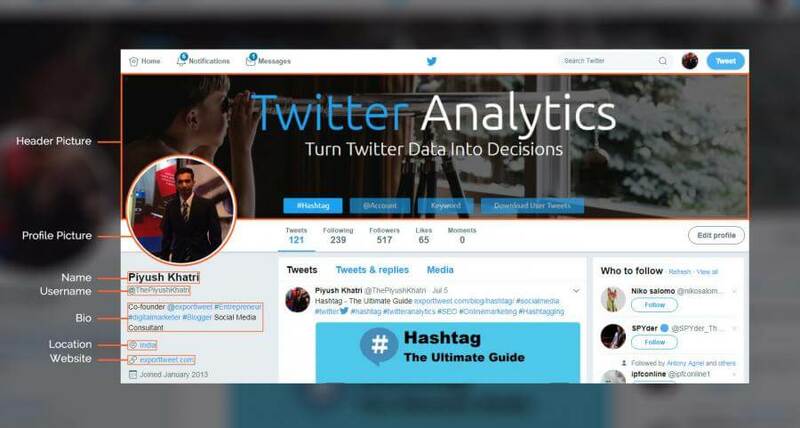 Profile picture: Statistics from Hubspot show that Twitter profiles with profile picture have 10 times more visibility as compared with the profiles that don’t have. This is the picture that your followers will be seeing the vast majority of the time. It is easier to remember profile photos than usernames, hence don’t change your profile photo frequently and I recommend you to use the same image consistently across all social networking sites like Twitter, Facebook and LinkedIn as it helps people to recognize you easily. But make sure your profile picture and the cover picture is within your niche. Upload a JPG or PNG file as Twitter does not support GIF images. The recommended image size for your profile photo is 400x400 pixels; the image will, however, be resized to fit. 2. Header picture: The header makes Twitter profiles much more visually appealing. Consider this your billboard. You can use event photos, feature products, a graphic with text, or highlight your work and team. Swap out this image periodically spotlighting promotions, events, product news or just to keep things fresh. The recommended dimensions for a Twitter header image is 1500x500 pixels. On mobile, it will be cropped to a 2:1 aspect ratio. Twitter Bios is a brief description of your interests, work, or personal life. Your Bios should be crisp and informative as you have only 160 characters. 1. Use relevant keywords: Keywords are super important when people search for you on Twitter. Focus on those particular keywords which describe you the best. If you are creating a personal Twitter profile then write what defines you the best. People use traveller, father, teacher etc. to describe themselves. If you are making a professional profile then you can start with your designation in your organization Like CEO, manager etc. 2. Use hashtags: Hashtags will help you get found in Twitter searches and using popular hashtags will help you increase your reach. If you are using hashtag approach be careful not to load your bio with lots of hashtags, I recommend using 1-3 hashtags in your bio which represent you and avoid meaningless buzzwords. You can also put hashtags which define your work like #SMM #SEO #SocialMedia #traveler #digitalmarketer. 3. Include relevant username: It’s better to include the @username of the company rather than just writing its name if you are an employee in that company. This is very useful when people search for your company on Twitter and if your bio has a Twitter handle of your company, you will appear in the search results. 4. 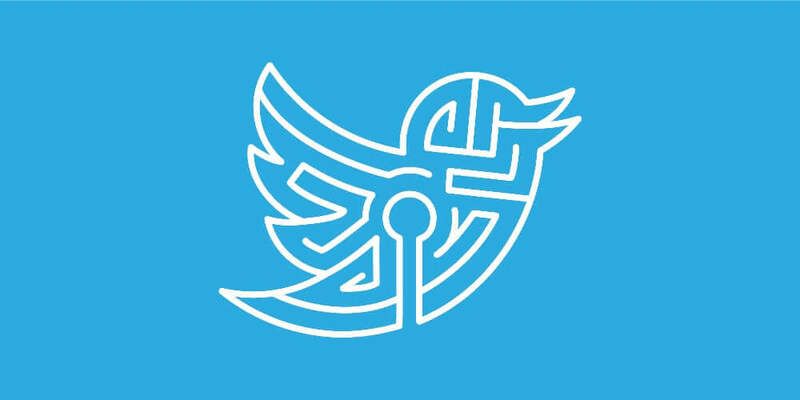 Website URL: Twitter has main link section but it also provides you with another opportunity to include a clickable link in your Twitter bios. It can be a link to your website, landing page or blog post. You can use this tactic to promote your website, blog-post or landing page. Use can also use bit.ly or goo.gl to shorten the website URL(s). 5. Email ID: Putting email ID in bios makes it easy for users to contact you. You should provide the email id which you use regularly. There are numerous awesome things you can state to describe your identity and what you do, you need to recall that Twitter is about the direct approach, as you just have 160 characters to work with. Twitter has emerged as a major digital marketing platform that can help you promote your brand or a product as well as your business activities. When you write your Twitter bio think about your desired domain and include related words and phrases in it. Make sure to provide the proper location of your business. As per the PARC research, only 66% Twitter users provide their accurate location. The ratio of your followings and followers shows how effectively you are using your Twitter account. You should maintain a good ratio of the following list according to your follower's list. Certain Twitter users’ following and followers ratio make it seem like they are using Twitter inappropriately. When you are following 2000 people, and have 67 followers, it looks like you are randomly following as many as you can, hoping for follow backs. Twitter profiles are set to public by default. If you’ve protected your tweets then, none of your hard work will matter. Make sure you’re visible. You can anytime switch your profile from public to private or vice versa, through account settings by un-checking “Protect My Tweets” button. While creating your profile if you are paying attention to each element like the Twitter handle, hashtags, keywords etc you will make your profile easily searchable for the people of your domain. They can easily connect and interact with you. With the help of an excellent profile, you will have a good number of followers in your account. You should build a positive relationship with them to grow your business and to create awareness of your brand. Every day millions of new users are joining Twitter and it is the best place to look for potential customers and interact with them. Twitter is a way to keep your followers up to date with current information about your business and it lets followers communicate with you too. Making a perfect Twitter profile is one of the most important factors to market yourself or your brand. Therefore, I recommend you to follow all the steps which I mentioned in this blog. Along with building a strong profile, there are lots of other aspects of “Twitter for business” which I have mentioned in this blog.